Helen and Jim met through a chance encounter in New Brunswick, NJ. Jim, a New Jersey native was working as a land surveyor at the time. Helen was finishing up her bachelor's at Rutgers and was still unsure what career was a good fit for her. Helen started volunteering on a farm in 2010. Within the year it was clear that a career in agriculture would be both fulfilling and challenging while making use of her ecology background. She set about gaining experience, working two more years on different farms and then decided it was time to start a farm of their own. In 2013, with Jim's love and support, Whistling Wolf Farm was born. 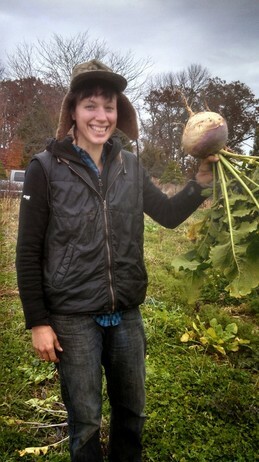 Helen leased about five acres in Hunterdon County NJ and for the next four years farmed her heart out, growing a wide variety of vegetables, acquiring the tools needed to operate a farm, and gaining the experience needed to be successful. 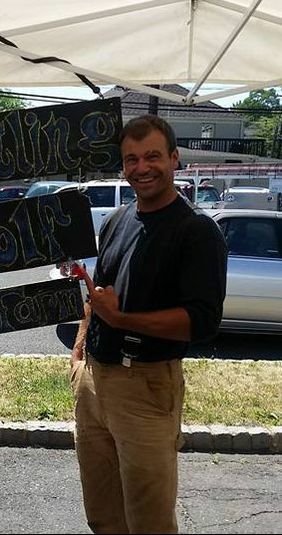 In the fall of 2014, Jim quit his job and began farming fulltime. So much happened in those years at Whistling Wolf it is hard to sum them up. We learned how to farm and how to work together. We gained A LOT of experience that we didn't have and really needed. We acquired two tractors along with implements needed for basic farm operations. We built a cold frame, a greenhouse, and a walk in cooler. We got organic certification. And we realized that we needed a place with long term tenure. We started looking for a place of our own in 2015 and in July of 2016, we purchased what was to become Lake Divide Farm: 54 acres of loamy sand and beautiful habitat, located in Jackson County, Michigan. Through the tail end of 2016, we worked in Michigan and New Jersey, sometimes making the 17 hour round trip multiple times per month. In Michigan we worked on repairing the house, preparing a small amount of ground for winter crops, finding markets, finding vendors for products needed, and networking. In New Jersey we still had a vegetable farm in full swing to deal with, we attended two markets until the fall, worked on selling our house, and struggled to pack up home and farm. ​In December 2016, after the New Jersey markets were finished for the season, the final push came. We packed almost our whole farm into a 40’ shipping container, put our farm equipment on a flatbed and our house into a rented box truck and headed out here to stay. In January 2017 we crash landed and launched our first year on our home farm. We were excited and determined. We were excited to have the chance to live and work in such a beautiful place and to become a part of this community. We were determined to make this piece of land healthy and diverse and to make nutritious, sustainably grown food available to all members of our community. We headed off into 2017, with the idea to recover from our crash landing, forge some lasting relationships, and lay a solid foundation for the many years to come. All told, I think we did alright. 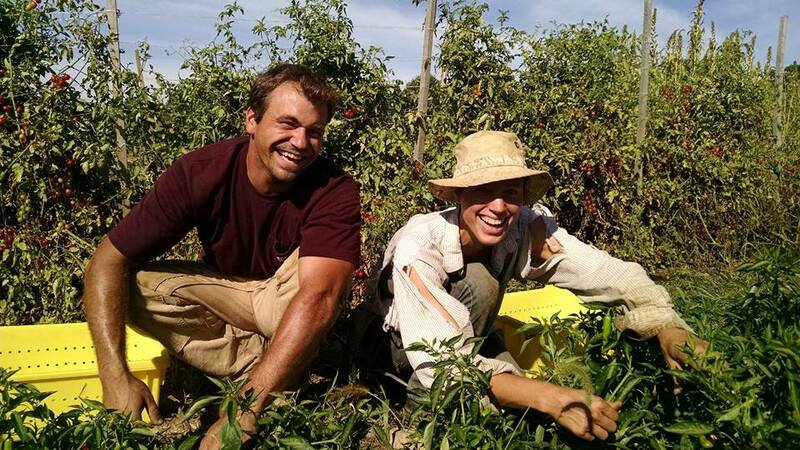 Us (Jim and Helen) picking peppers the first year we worked together (2014). A wonderful journey it has been. A wonderful adventure it will be. 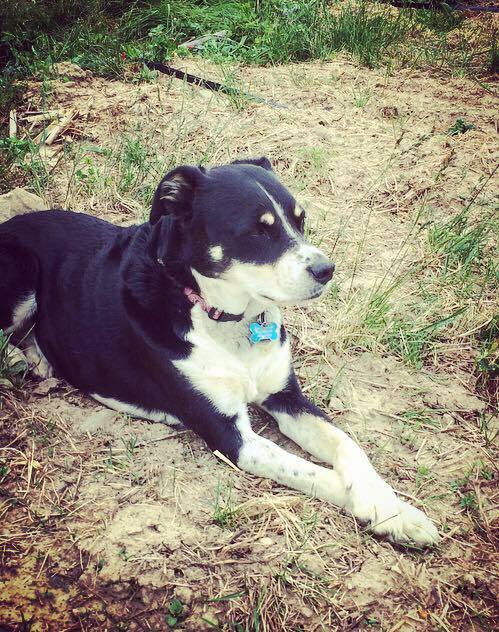 Exie the dog, always a lady.